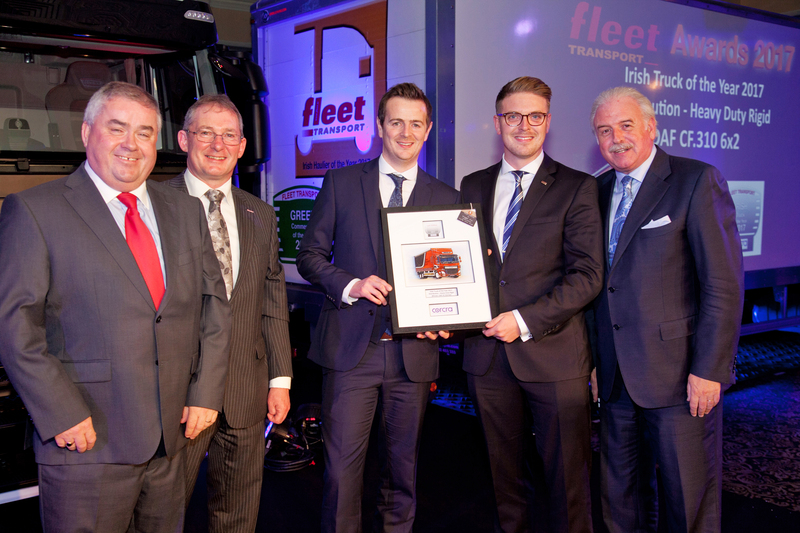 DAF CF Wins Prestigious Award in Ireland - DAF Trucks N.V.
DAF Trucks received the prestigious Irish Truck of the Year award at the 2017 Fleet Transport Awards in Dublin. The versatile CF distribution truck with the state of the art PACCAR PX-7 engine was named the Irish Truck of the Year in the ‘Distribution – Heavy Duty Rigid’ category. 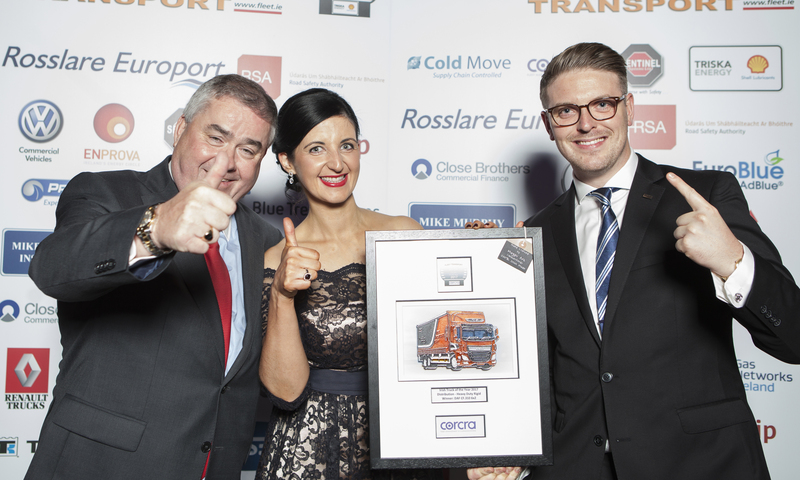 The prize was awarded at the 10th anniversary of the Fleet Transport Awards Gala Dinner. Picture: On the image from left to right: Nicky Gill (Sales Director DAF Distributors Ireland), Jarlath Sweeney (Editor Fleet Transport), Robert Steele (Corcra Communication - sponsor), James Turner (DAF Trucks) and Marty Whelan (Master of Ceremonies). The award winning DAF CF 6x2 distribution truck is equipped with the 6.7 liter PACCAR PX-7 engine, which stands out in reliability, durability and fuel efficiency. In its report the jury praised the advantages of the low engine weight, which results in an industry leading payload. The jury emphasized that the day cab is very well equipped for drivers in the busy distribution sector, who also benefit from a very smoothly operating AS Tronic automated gearbox. The steered third axle contributes to excellent maneuverability, which is of the highest importance in urban and regional distribution.